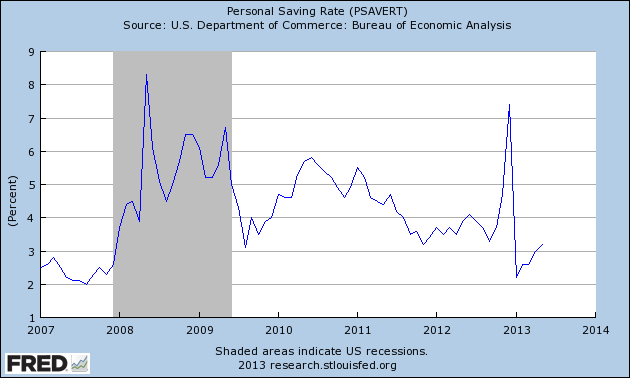 Personal savings rate tumbles from the year-end FICA hike and sequester cuts. U.S. economy running dangerously low on the net-financial equity that supports the private credit expansion. Private credit expansion has to 'overcome' the procyclical headwinds of higher taxes and less government spending to sustain the same amount of aggregate spending and employment in the economy. I see no evidence that the private credit expansion is 'heating' up to 'fill-in' the output gap created by government tax hikes and spending cuts (i.e. restrictive fiscal policy). The FED's own research shows that the "wealth effect" is associated with housing prices, and not stock prices. But try as the FED might to manipulate interest rates and stock prices, it can't jump start housing or any leg of the credit expansion in any sustainable fashion without more credit-worthy borrowers, and that takes jobs and income gains. The right way to fix the economy is from the bottom up, and you get there with demand side tax cuts or government spending increases, all depending on your politics. I can understand the low savings rate for the first six months of 2013, but it is nevertheless trending slightly upwards. What I don't quite grasp is the anomalous 6.4 rate in December 2012. Isn't Christmas time a time for spending? I agree with your statement: "The right way to fix the economy is from the bottom up, and you get there with demand side tax cuts or government spending increases, all depending on your politics." The right way is more government spending. The surge was from dividend payouts before the fiscal cliff. Problem with gov't spending is that Congress has to make a ton of decisions and there's a lot of lag time once Congress makes the decision to spend. Full FICA tax cut provisions immediate relief. Thanks for clarifying the yearend spike in savings. Regarding FICA tax relief, yes I'm okay on that, but it doesn't rebuild our infrastructure. If I had a choice I would like to see a massive government infusion of money into rebuilding our infrastructure...highways, bridges, schools, water and sewage systems, airports, railways, high speed rail, public transport, wind and solar energy, expanded broadband services, plus funds for education and research grants, and student loans plus block grants to the states for police, firemen, teachers and such. All of this government spending will generate good jobs and stimulate the economy. Private companies will do little of this on their own...without tax write-offs. And local governments are revenue starved as the recessional effects linger on. FICA tax relief will generate more middle class spending and that will also be good for the economy. However, it's harder for me to see how that will help in rebuilding our infrastructure. It'll certainly help middle class families coping with day-to-day expenses, but building things will also do that in terms of providing better paying jobs...and the things we build are longer lasting than just the short term benefit of spending (subsidizing) on Walmart's Chinese imports. Stephanie Kelton puts the infrastructure deficit above $2 trillion dollars. I agree that we need more gov't spending for public purpose. Given the size of the output gap, FICA tax relief is just a start of what we need to get to full employment/full output. But if Republicans want to cut gov't spending, when there is no excess demand or demand side inflation problem, then if they don't implement tax cuts of larger proportion (because some of the tax cut will be saved, but gov't expenditures are all spent by definition), all they have done is shift part of the 'burden' of government from the real resource side to the tax liability side of the private sector, and with no public purpose to show for it at all. That's Big Government, by their own definition, and for the hell of it. So either they don't understand how the monetary system works or they are subversives. Either way, the balance budget myths that they espouse are the greatest threat to the American economy we've ever faced. It's like this: if I am the issuer of the currency, but don't know it, and I behave like I am a price taking participant in the market, who like everybody else must acquire the funds to spend before I can spend, I am going to end up taxing the rest of the economy to death and blowing up the deficit the ugly way (recessions). So they may not like that taxes "drive" the acceptance of the currency by the nongovernment, but it's not about what they like, it's about what they are actually doing and how the system actually works. And right now, they are bleeding off the consumers in the economy for no reasonable public purpose, and this is across the board at all levels of government. Taxes are too high and the gov't deficit is too low per the given amount of government spending + private credit expansion. "I don't worry about numbers on pieces of paper. I worry about jobs!" -George W. Bush in the spring of 2003 when asked about the deficit.